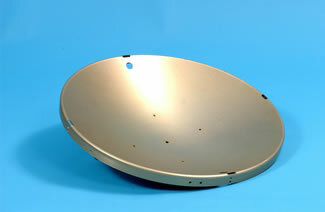 JH Nunn specializes in Hydroforming metal components. 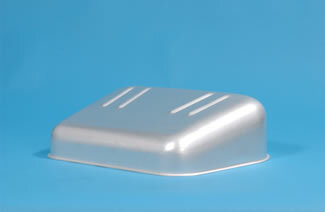 We have been a top supplier of Hydroformed Enclosures, Covers and Assemblies for over 30 years. Hydroforming metal is similar to Deep Drawing Metal, but instead of using matched Draw Dies, only the Male Punch and a Holding Ring are required. The part is formed by pressing the metal blank into a rubber diaphragm which is pushed into the punch by hydraulic oil pressure. The Holding Ring is used to hold the metal blank while the punch is pressing it into the hydraulically supported diaphragm. 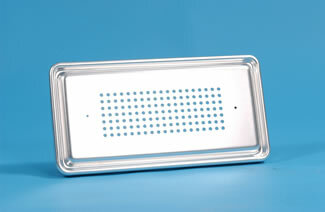 Hydroforming metal requires only half the tooling, which reduces tooling costs and lead times. 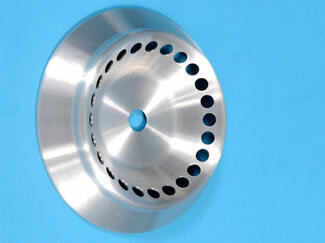 Another advantage is that only the interior of the part comes in contact with a metal tool. The exterior is formed by the rubber diaphragm. Since only rubber has contacted the exterior of the part it is very clean and cosmetically free of scratches and tool marks. For metal Enclosures that have to look good without any secondary operations, Hydroforming is a good way to achieve this with minimal cost. Typically when deciding whether Hydroforming Metal is the proper process, there are several factors to consider. Because it is just hydraulic oil pressure forming the part corner angles and radiuses cannot be as small as in a Deep Drawn can or enclosure. Usually the Hydroforming process produces Covers and Enclosures that are sloped with sides that have some draft and radiuses that are larger. Also Hydroforming Metal can be a slower process than Deep Drawing so typically the production quantities tend to be lower for Hydroforming. Hydroforming metal is a seamless forming process that eliminates the need for Welding, Dip Brazing and Spot Welding. Seams provide potential leak paths that require secondary inspections like X-ray and pressure test to detect voids and cracks. Metal Enclosures that must be environmentally sealed, radiofrequency interference shielded, electromagnetic interference shielded and electrostatic discharge grounded are all good candidates for Hydroforming. Because there no seams Hydroforming is excellent in medical, clean room, food-service and a wide variety of special situations. JH Nunn offers Hydroforming Metal capabilities combined with complete secondary operations that allow us to ship your component complete to print. Because we are vertically integrated we do Tooling, CNC machining, Blanking, Forming, Heat Treating, Welding, Dip Brazing, Iriditing, Anodizing and Painting all in house. This eliminates the need to ship parts back-and-forth between subcontractors to complete a ready to use part. By doing all the work in-house we cut costs and lead times and have complete quality control in one facility. Our quality system conforms to Mil-I-45208. We have supplied the Defense Department for many years and our commercial customers benefit from the same stringent quality standards that the military requires. 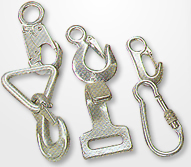 Contact JH Nunn to for hydroformed metal products, or to learn more.